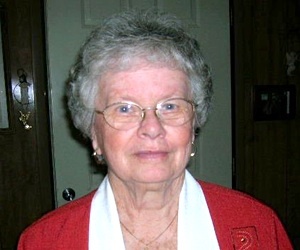 Margaret Anne Basore, 84, of Linn Valley, KS passed Saturday July 9, 2016 at the Hospice House of Olathe Medical Center. A memorial service will be held at 1:30PM Wednesday July 13th at the Penwell-Gabel Funeral Home, 14275 S Black Bob Rd. Olathe, KS. A time of visiting will follow the service. Private burial will be at Oaklawn Memorial Gardens. Margaret was born April 2, 1932 in Spring Hill, KS to Henry and Eva Mae Helm. In 1935, she moved to Olathe, KS, where she attended Olathe High School. She worked for the Johnson County Sherriff Department and later worked at Patrons Bank until she retired. Margaret enjoyed working in her flower garden, watching deer from her porch, and feeding the humming birds. Margaret enjoyed playing the piano and organ for many churches until she became ill in April, 2016. Although she had many interests there was no greater treasure than her family. Margaret will be remembered for her kindness, warmth, guidance and friendship. She married Robert Basore on June 4, 1970. Margaret and Bob enjoyed many cross country motorcycle trips with friends. She remained in Olathe until 1995 when she moved to Linn Valley Lakes, KS. She was preceded in death by her parents Henry Helm who passed in 1968, and Eva Helm who passed in 1983. She is survived by her husband of 46 years Robert “Bob” Basore, her sister, Lois Helm, Olathe, KS. Her children; David Brink, Loveland, Co., Cheryl Brink, Colorado Springs, Co., Nancy Greenhaw (Joe) Colleyville, TX., Mark Brink (Lee Ann) Lakewood Ranch, FL. Seven grandchildren: Kristin, Allison, Lori, Kelly, Jeff, Justin and Amber and 11 great grandchildren: Samantha, Celeste, Clayton, Carson, Kara, Faith, Julia, Reagan, Peyton, Taylor and Aidan. She spent her final days surrounded by her husband, four children, grandchildren, great granddaughter, extended family and a great many friends. The family wishes to extend their gratitude to the staff at Olathe Hospice House for their support and compassion during Margaret’s final days. In lieu of flowers donations can be made to Olathe Hospice House, 15310 S Marion St, Olathe, KS 66061. To leave a special message for her family please use the “share memories” tab above.